Today I was on a monster steak mission, and I scored two huge top sirloins. These bad boys were about ten inches across and just shy of 1 1/2 inches thick. We're talkin' steaks that would almost make a cowboy blush. For this beef extravaganza I decided to try pairing two steak preparations that I've previously featured -- "Steak: Average to Awesome!" and my "Cowboy Top Sirloin". I simply used each method in succession and the results were incredible. The steaks were perfectly seasoned throughout, with a great crust. These were select grade, but you'd never know it. Admittedly, there's not much new in this post, but I thought I'd share it anyhow. If you want a seriously killer piece of cow, give this method a shot. Incredible steak? You aren't kidding! I used this recipe for a couple of inch thick ribeyes and they were so fantastic!! The seasoning was spot on! I was surprised the chili powder wasn't over powering but it wasn't at all. I cut back on about half the salt/garlic salt in the seasoning blend and threw on some granulated garlic and minced garlic. I can't wait to try these on the 2 inch thick filets I have waiting in the wings. Will the salt method work for filets or are they too lean? Kim - Thanks for the comment. I'm really glad that the recipe worked for you. 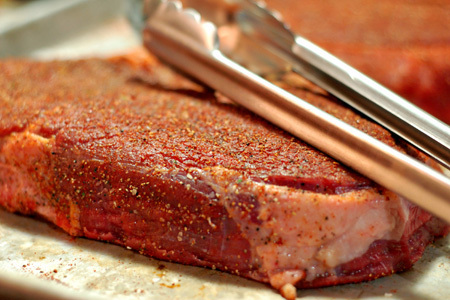 The salt method would be fine for filets.